I’ve received so many messages of support. Friends, coworkers and family have checked in religiously to ask how things are going, and now that I have had a couple weeks to distance myself from the experience, it’s time to share the story. January - In the beginning of January, I was officially invited to join preseason with the Spirit. While I’ve absolutely adored my time abroad, after a great year of development in Sweden, I felt like it was the right time to give playing in the US another go. 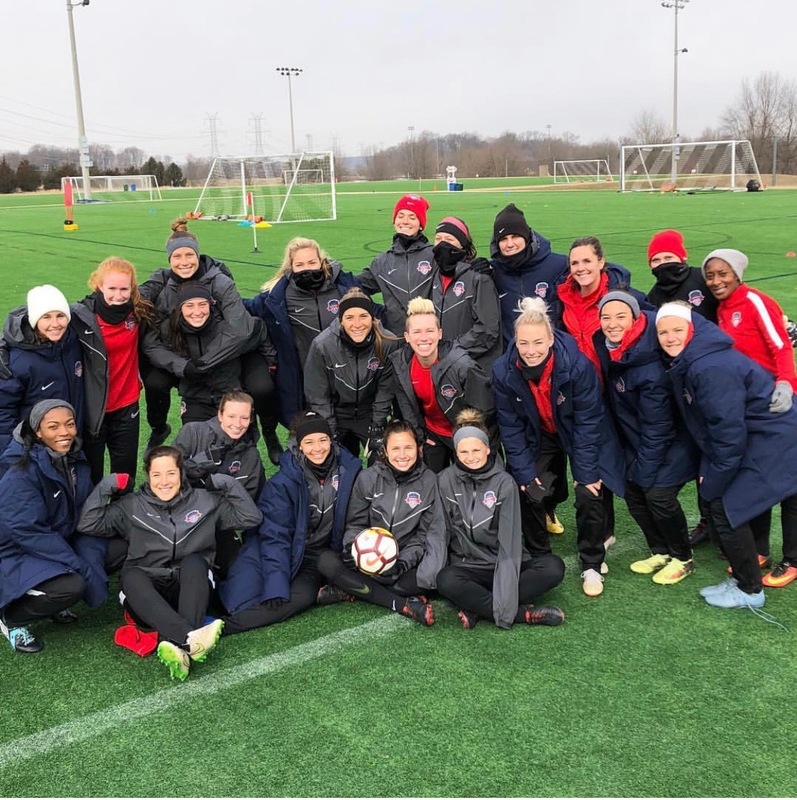 With a partner, family and a job in the states, it surely would make things easier being in the same timezone, but even with all of that, my gut was unsure, and I can’t say that I didn’t have my reservations to give the NWSL another shot. I’ve been pretty open about my experience with the Breakers in 2016 which nearly ruined my love for the game entirely, and I’ve heard from many players who’ve had a similar experience. I only hoped this wouldn’t be history repeating itself. All that said, if I’ve learned anything from my younger self and believe me, I’ve lived with a lot of regret based on walking away from opportunities in the past, it’s that sometimes, you just have to follow through. Even if you’re not sure, even if you’re afraid. So that’s what I did. I turned down concrete options overseas to give the ultimate dream a chance to live on. February - I’ve all but taken an oath that I am done trying out for teams. After the Breakers, I was sick of feeling like a second rate citizen. But there I was in Australia in 2017, asked to join the Brisbane Roar for a month in their offseason, and I couldn’t say no. I didn’t realize, but the head coach wasn’t even there for the entire month, leading me to believe I never really had a shot to begin with, and so again I told myself “I am done with this.” As luck would have it, a Swedish team reached out to invite me to Uppsala for a week, and lo and behold, I signed with them a few weeks later for the 2018 season. But after that, surely, I thought, I would be done proving myself in just a week’s time to a team. I just didn’t want to go through it again. I could always go through an agent, I suppose. There are plenty out there and they send players like me all over the world: Israel, Kazakhstan, Cypress, Iceland, you name it. But I just feel like no one is going to advocate for me like I can advocate for myself. And advocate for myself, I must. As you can imagine, one of the cons of being too stubborn to work with an agent is that I have to do all the work myself. All the emails, calls, research. It’s all me. Sometimes, I daydream that I pick up the phone and say “Jeremy (imaginary agent)! Find me a team in the South of France outside a dairy farm that makes the world’s best brie and nearby a vineyard… and make it snappy!” Alas, I don’t have that luxury, so the grunt work is all on yours truly. So when I did my own outreach to the Spirit, and got connected via a former coach of mine, I thought… okay, let’s see where someone like me (who has floated under the radar for a long time), can go. The week leading up to the first day of preseason was the first time I felt the familiar pit in my stomach, or the wave of unease. It’s the feeling that says “are you sure you want to be doing this? You promised yourself, no more trials.” But I pushed that further down, got in my car, and headed south. 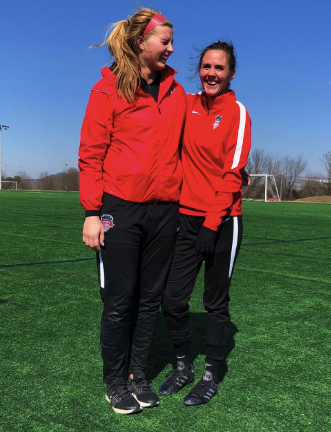 I drove down to DC at the end of February and moved right into my best friend from high school’s house in Arlington, VA. It’s about 35 minutes from the Soccerplex and was honestly the best reprieve after busy mornings with the team. I took a few days to settle into my new home away from home, but mostly I was looking at the ticking clock waiting for Monday to come. Monday - A few weeks before preseason, my former teammate in Sweden told me that she would be down in DC as well. I cannot tell you how happy I was to know that I would at least have one friend there. There’s nothing quite like the feeling of walking into a locker room alone. It doesn’t matter how many teams you’ve played on, or how outgoing you are, those initial few moments are made for sizing one another up, and you can feel the tension (even if it’s hidden behind friendly introductions). The Soccerplex is exactly as I remember it, and once I pushed through the big glass doors to walk inside, I was transported back to 21-year-old Jessie. It was a mix of excitement and apprehension. Was I really doing this again? I love soccer more than anything in the world, really, I do. But arriving there on Monday morning, all I could think about was getting the first session under my belt. As soon as we got to the field, it was very clear who was on the roster and who was on trial. Now is a good time to mention that there were 12 of us fighting for a contract, and we stuck together pretty relentlessly. Even though you’re all competing for the same few spots, you form this bond of “us versus them” pretty quickly. It’s a survival tactic. After a brief warm up and some technical play, we moved into passing patterns. This is an area that I know is a little touch and go for me. Isn’t that crazy? I’m a professional soccer player who still doubts her ability to execute a passing pattern. But it was fine. Inhale, exhale, repeat. I know how to pass a ball, I kept reminding myself. Here is the crazy thing about confidence. In Sweden and in Australia, I made little mistakes all the time. Anyone who says they don’t make mistakes is either a liar or a coward. But once I’d proven myself as a valuable member of the team, I never gave those mistakes a second thought. It might hover for a half a second, and then I’d move onto the next play. But when you know you’re being watched and evaluated, every miniscule error feels enormous. Even the smallest of missteps feels like a glaring light up sign that says NOT GOOD ENOUGH. And it doesn’t matter if you know you’re good enough, because in that moment you’ve gotten yourself caught up in something miniscule. In those moments, I've learned to focus only on myself instead of watching others, and so that's what I did. I paid attention to my own play, and slowly but surely, I eased into the session. We moved into some smaller sided games later into the training and I was pleasantly surprised to get to do a lot of defending. A lot of players like to score goals, but I am most comfortable when I don’t have the ball. I know that sounds counterintuitive, but I just love playing defense. We never got bigger than half the field the first day, much to my dismay. I know this sounds a little strange, but I am really a game player. I’ve written about this countless times, but I will remind you: I’m not the person who might play the prettiest pass, and I sure am not the one that is trying to dribble through players. But what I am, is the one who will do the ugly stuff. The tackles, the air balls, the chasing. I am the one who is left on the field when everyone else has given up, and sadly, that doesn’t often shine through in small sided games. The level of training was good. The ball moves fast and you better be ready to make a decision within a couple of touches. But it wasn’t anything I hadn’t seen before. I’d say it is a touch faster than Sweden, but part of that comes from everyone on the Spirit being incredibly athletic. That is something that the US just does better than other countries (in the women’s game). Don’t fight me on that. After the first session, the rostered players got lunch and went to a gym session, and the rest of us headed in our own separate ways. Like I expected, it was total relief to have the first session under my belt, and I was so excited to go home to my friend’s place in Arlington and hang out with her two babies the rest of the afternoon. Tuesday - Day two felt a little bit better than day one because I was able to relax more. As usual, we started with some foundation technical work and passing patterns, and… you guessed it…. Conditioning! I know this sounds a bit crazy, but I was overjoyed when we were lined up on the endline, because I know that I can run and run and run. I mean believe me, I don’t like fitness any more than the next person, but it’s something that I am good at, and when you’re being watched, it’s nice to go into a drill that you feel proud of your abilities. Post run, we ended with more small sided games and drills that were based on working it out of the back in a back four and I felt really good about that. This was the first time we worked within a back four, and it was the first time I realized that I wasn’t playing center back. I was outside back on the left. And I can’t say I was super jazzed about that. I have been playing center back pretty exclusively since my Junior year at Penn State, and I have really found my home there. Being back on the outside was fine… but I felt a bit out of position being on the ball as a bigger playmaker than I am used to. Also, it was on the left side, and while I can do that, I’m just not sure it’s where I can showcase the most. Alas, if they were looking for an outside back, then an outside back I would be. I left Tuesday feeling a bit better than I did the day before, and that was good enough for me. Wednesday - On Wednesday morning, I started my day feeling really energetic and grateful just to be waking up to play soccer. Even though I had settled in a bit during the first two days, I still hadn’t completely relaxed. I was having a hard time eating, and if you know me, you know this is crazy. On the drive to training that morning, I struggled to get a dry and crumbly granola bar down as I prepared for the two sessions ahead. The morning session was pretty technical and lighter, because in the afternoon we would be playing 11v11. More passing patterns (Richie loves them!) and small sided games. It was beginning to become pretty apparent which teams were which. If you were on the blue team, things were looking up. Yours truly still hadn’t gotten a shot with blue, but I knew after the 11v11 that I’d be feeling good. In between the two sessions, the 12 trialists all stuck around for lunch. We weren’t entirely sure where we were supposed to be and when, and it’s safe to say the mood was a bit antsy. Not knowing where you stand, and realizing you could be cut at any moment is not the most comforting of environments. In my head, I kept reminding myself that soon we would be playing the REAL game, and I could hold onto that, even with the unease of the day. Again, I picked at a turkey sandwich even though I was starving. I started to wonder how much stress I was really carrying with me. After slugging a coffee (shout out Shae for going to Dunkin! ), we were heading back on the fields. The teams were split (again, clearly it was the trialists versus the contracted players), and finally I was in my element. Even if it meant I was playing outside back, I was on the big field, and that is where I am afraid of nothing and no one. Our back line consisted of myself, Jackie, McKenzie and Meghan. Throughout the entire 45 minutes, no one got in behind us. I’d like to think that in another life, we could have been a back four somewhere. It just felt good. I was so happy to be able to show what I can do in a full field situation. The game, though clearly slanted toward the contracted players, was completely even. It was clear that 12 of us were fighting for a spot, and the speed of the game was flying. I was really in my element. This is what I live for. I shutdown everything that came my way. Whether it was a slide tackle or a 50/50 ball or chasing down a player on a breakaway, nothing got past me. I finally felt like myself. There is a lot of ego in the players in the NWSL, there I said it. Someone had to. And I get it. You’re allegedly the best of the best. Having NWSL experience will get you into any other league in the world, almost no questions asked. I think it’s so important to be confident, but arrogant? No need. Ain’t nobody got time for that. So for little old me with my humble background, it was great walking off that field knowing I didn’t get beat once. After that session, the whole team did a cool down with the conditioning coach, and Richie pulled the 12 trialists aside to let us know we would have a quick chat with him about the next steps. Of course we were all jumping to conclusions, but I strangely felt void of any anxiety. We headed into the conference room and awaited our fate. I know this sounds dramatic, but it’s the truth. The coaches came in and explained that no one would be signed that day, and that we would be having individual meetings with them to discuss where we stood. They asked for us to organize ourselves outside and be ready to come in one by one. We all sat, half in silence scrolling through our phones and the other half playing basketball to keep our minds occupied. Slowly but surely, players were coming out of the room, either turning right, back to the group with a relieved look and a thumbs up, or turning left and immediately leaving the complex. I’ve been on both sides of that, and it’s just awful. When it was my turn, I took a deep breath, held my head high and went into the room with the coaches. “Jessie Davis,” I heard Tom whisper to Richie. “IT ME,” I thought to myself. As soon as we started chatting I realized there was nothing to worry about. We talked about how my body felt and if I was having fun. I said I felt a tiny bit out of position, but I loved playing 11v11. I told them it’s where I came alive. “We can tell,” said Richie. They explained to me that I was invited to continue training (phew). They hadn’t made any decisions yet, and while they were impressed with my work that day, they made it clear that every move I made would be under a microscope. At this level, I can’t just be a person who thrives in a game environment. The details mattered too. They told me I needed to command the players around me, and that I shouldn’t be nervous to put a contracted player in her place. Believe me, I said, I’m not afraid of anyone here. But inside I thought… I am happy to command the contract players around… but I need a chance to be on their team first. I walked away from that conversation feeling like a weight was lifted, and I headed home feeling pretty happy. Six of the twelve of us were released that day, and we were told a few more new players would be joining us. From then on, the remaining six of us became very close very quick, and I can say that if it wasn’t for them, it would have been a long few days. Friday - Oh sweet, sweet glorious Friday. Things felt different now. The group was smaller, and it seemed like things were shaping up a bit. I can’t remember what we did that day, but I do know that I felt at ease, able to relax and just enjoy a short reprieve… if only for a day. Saturday - Early Saturday morning, I had my alarm set for training. 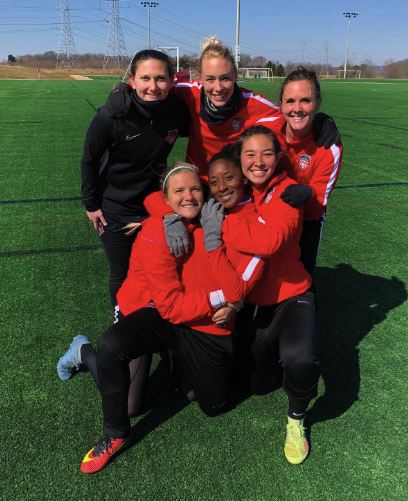 There would be a bit of a change of scenery, as we moved training from the Soccerplex to George Mason University. I got my Master’s there in 2011, and haven’t been back since. What a reunion! Our first session was inside in the Field House. As it’s a hard surface, we were a bit limited with what we could do, so we stuck to soccer tennis, some passing patterns per usual, and some conditioning. In between the sessions, we had lunch and we did some breakout work in positions and talked a bit about what tactics the Spirit would be using in the upcoming season. It was fun to sit in on this, because it was starting to feel a bit more like a team, and less like a trial. Our second session would be outside on a grass field. We were told we’d be playing 11v11 and I was looking forward to that. For the first time, I felt a bit lethargic on Saturday. Finally, my legs were catching up to me, and the feelings of excitement and confidence weren’t as strong as they had been the day before. The 11v11 turned into 10v10, and I know that shouldn’t be a big deal, but I felt the difference. The teams were split again, and the on-trial team was supplemented with a few 17-year-olds from the area. One is heading to Penn State (woop woop!). I don’t know if it was the super muddy grass fields, or my legs being heavy, or my mind getting the better of me, but I started to second guess everything. Did I want to be on a team where I might never really get a shot with the starters? Did I want to feel like I could never make a mistake without looking over my shoulder to see if the coaching staff saw it? Is this how I saw my last season(s) playing? I wasn’t so sure. After training, I was pleasantly surprised to see a text from another teammate of mine in Sweden letting me know she would be at preseason the next week. A bit ominously I texted her back “Amazing!! I’m not sure if I will be around or not, but hopefully I will see you Monday!” I really hoped that was true. Sunday - I tried to shift my mentality Sunday, but I was struggling to get out of my own head. I was beginning to feel like an afterthought, and that is a terrible place to let your mind wander. I dove into the training unable to shake the sliver of doubt in the back of my mind, and once it was there, I couldn’t shut it off. We played at Robinson High School, which is just down the road from where I grew up. I saw a bunch of young girls wearing BRYC training shirts, and they shouted and waved from the sidelines when we walked by. That was a club I played on for a large part of my youth career, so I waved back and yelled “Yeah Braddock Road!! !” Right. These young girls. This is why I do what I do. So that someday, these girls have even better opportunities than I do. Perspective always helps. Post training, the 6 of us on trial were pulled aside, and briefly explained what was going to happen next. The coaching staff had mostly made their decisions on us, but needed to figure out minute details, so we wouldn’t have an answer until later in the week. Imagine that. Your answer is right in front of you, but you couldn’t hear it. It’d be like getting a letter from your dream university after you applied, but letting it sit on the counter for a few days. As Tom Petty said, “the waiting is the hardest part.” Damn you Tom Petty. Monday - By Monday, all the national team players had arrived (as had some new trialists), and the level raised another notch. By then, I was used to the speed of play, and it was fun to be competing against the likes of Mal Pugh, Rose Lavelle and Andi Sullivan. And honestly, this is where my age kicks in, but I wasn’t star struck meeting these players, like I was with Abby Wambach ten years ago. I mean, I am a good decade their senior. I coached players older than they are. They wouldn’t have even been old enough to be one of my recruits in college. That’s a big age gap. And that is when it really hit me. The odds are definitely stacked against you. Think about these numbers: less than 10% of high school soccer players end up playing in college, with only 2.3% of those being NCAA Division I. There are 333 teams in Division I, averaging 28 players per roster. That means 9324 players total. If we divide into the four classes, that would give you roughly 2330 seniors graduating each year. 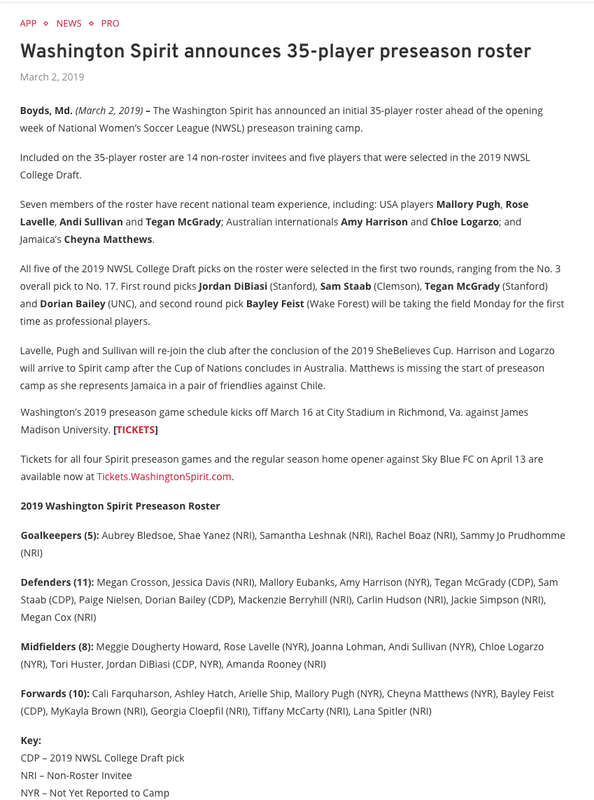 Many of these players will quit, some will play abroad, and a select few will get drafted and/or signed in the NWSL. The youngest player on the Spirit was 21. The oldest was 36. That means there were 15 generations of players on that roster. If we take that number and multiply 15 by the 2330 graduating players a year, that gives you ~35,000 players competing for JUST 250 spots on 9 teams… meaning the top .7% in each class. That doesn’t even include international players, or take into account that 4 roster spots per team are reserved for supplemental players. All I’m saying is, that’s a lot of women competing for very few slots. Anyway, that’s enough math for now. Tuesday - By Tuesday, I just wanted an answer. I didn’t care if it was yes, no or a maybe so, I just needed to hear it. You have to imagine, I’ve been planning what I am doing in 2019 since August. That’s almost 8 months of unknown. It’s enough to drive even the most level headed of people insane. God, for someone who had resolved herself to running laps and getting cut, I was definitely pumped to be back playing. But I couldn’t shake the feeling that if I made this roster, I’d always be on the outside looking in. Again, “is this really what I want?” was creeping in my mind. “Will I always be watching others play?” It was sobering. Training ended and soon we were back inside learning that we’d be doing individual meetings after lunch again. Thank God, I thought. Like I said, I just wanted to know. I sort of did know, right? But I just wanted to hear it from the Coaches mouths. Walking into the room with Richie and Tom was pretty surreal, as I was almost sure I knew the answer. Both were giving me the “I don’t want to have to tell you this but-“ look. I sat down and prepared for the news. The short version of the story is that both were really nice. They complimented my play and invited me to continue to stay and train with the team all season, or even in preparation if I wanted to trial with another team. Injuries happen, they mentioned. World Cup is this summer, they reminded me. I remember nodding and looking out at the window. I think a younger me might have accepted that, and been excited at the opportunity to just hang around the team. Before I went into this experience, I had a few parameters set for myself, as this is likely going to be my last season playing. I knew that I wanted to be more than someone cheering on the sideline. I knew that I wanted to be more than someone who got a chance on the field here and there. I knew that I wanted to play a role with big impact on the team. In short, I knew I wanted to be somewhere that was sure that they wanted me back. I didn’t want to be #27 on a roster of 26. And so, as hard as these things can be, I thanked both coaches and walked away from the Soccerplex once more. Tom and Richie were nothing if not sympathetic to my situation. I’d like to think in another time, if I were a few years younger, things might have worked out differently. But I do know that I walked away absolutely sure that I could play at that level, and at this point, that’s okay with me. The Spirit only ended up signing players they drafted and those with prior NWSL experience. I can’t really do much about that. If you don’t break into the NWSL as a college draft pick or shortly thereafter, your chances are lessened greatly. I went into a situation where I knew a very likely outcome was that I wouldn’t make the team, pushed all the doubts aside and dove in. I turned down some very solid options to give the NWSL route a shot, but I now know that I never have to look back and wonder “what if?” I’ve found that most of the regrets I have in life have come from me not doing something, rather than regretting the things I did. I can’t tell you the number of people who I’ve filled in about the Spirit and have said to me “I am SO sorry it didn’t work out.” And honestly, I know it comes from a good place, but I don’t want people to feel sorry for me about this. I play soccer… as my JOB. I’ve seen more of the world in two years abroad than I ever could have imagined. I have met some of the most incredible people, and I’ve been reconnected with so many friends, coaches and teammates from my past. I got to go to my hometown and live with my high school bestie and her babies. I got to train with national team players and former teammates and most of all, I got some closure on something that’s been on my mind for ten years. I can finally, officially, for now and ever, close the door on the NWSL. I've also heard from so many people that they were shocked I didn’t make the team. This mostly stemmed from a place of “but you’ve worked so hard!” And that’s true. I have been working hard, but I bet you could say the same for each and every player who was there. Like I said before, the odds are stacked against you, and as much as you want to be in a warm fuzzy team environment, it’s you or it’s her, and believe me, you’re rooting for yourself. So here I am, with it all out on the table. It was an incredibly humbling, stressful, fun, competitive environment. Let me stress competitive. I’m almost always the most competitive one on my teams, and here, my competitive spirit was a dime a dozen. Each and every player had that attitude. American female athletes leave it all out on the line, and I am proud to be one of them. All this to say, I’m looking for my next team now, and I know I want to be somewhere where I am not the afterthought. I’ll likely be heading back overseas, and the big question is where. So now, we wait again. Remember, via Tom Petty, the waiting is the hardest part. But, on the other hand, waiting can be exhilarating, provoking and full of possibility. So... here we are again. As I’ve said before, where to next? I’ll be sure to keep you posted. Thanks for reading.